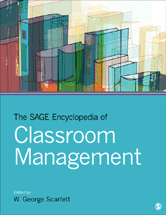 The SAGE Encyclopedia of Classroom Management raises issues and introduces evidence-based, real-world strategies for creating and maintaining well-managed classrooms where learning thrives. Students studying to become teachers will need to develop their own classroom management strategies consistent with their own philosophies of teaching and learning. This work aims to open their eyes to the range of issues and the array of skills they might integrate into their unique teaching styles.